The project of making a reliquary to display relics of several saints was providentially put in our hands in the Summer of 2008. Derek Rubio participated as a volunteer, working with the black walnut wood. Father Bauza sands down past the sandpaper. Does anyone smell burning rubber? Mariana Lopez and Selina Romero help with varnishing. Renee Allison details one of the doors. Chris Williams coordinated the project and designed the reliquary. Father Ricardo Bauza helps sand the wood. Derek Rubio writes the names of all the participants on the back of the reliquary. The project progresses thanks to the hard work of many parishioners. By God’s will and God’s providence the project is becoming a reality. Mariana Lopez, Chris Williams and Liz Portillo all work together. 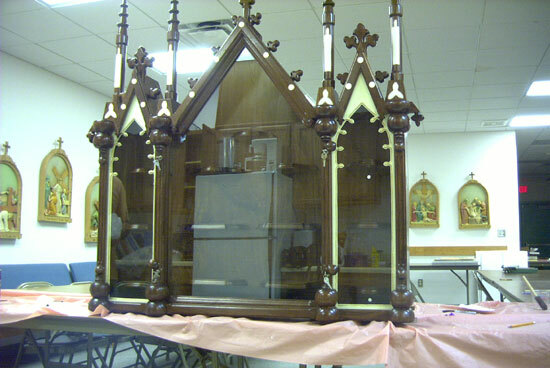 The black walnut wood used to build the reliquary was donated by Stephen Elchlepp. Gloria Gonzales a volunteer who worked for hours on the little pieces. Father Ricardo Bauza, Stephen Schlepp, and Chris Williams. Mission accomplished!